Kumbhakarna, the younger brother of Ravana was one of the interesting characters in the epic, Ramayana. He had a huge monstrous body and was usually feared for his appetite. He was described to be exceptionally knowledgeable and righteous. He was supreme in power and was considered so pious and intelligent that the king of gods, Indra was jealous of him. It is said that no one from Indrasena (Indra’s army) could challenge Kumbhakarna or defeat him in any of the aspects. This means that Kumbhakarna was extremely powerful and there was no one who could challenge and defeat him in the whole world. Kumbhakarna had two sons; Kumbha and Nikumbha, from his wife Vajramala. According to Shiva Purana, Kumbhakarna had another son named Bheema from his wife Karkati, who fled to Dakshini- on the ranges of the Sahyadri mountains with his mother. One fine day, Kumbhakarna, along with his two elder brothers, Vivishana and Ravana, completed their meditation. Lord Brahma was so impressed by their worship that he appeared in front of his devotees to grant them a boon. When it was Kumbhakarna’s turn to ask for a boon, his tongue was tied by goddess Saraswati (acting on Lord Indra’s request). Kumbhakarna wanted Indraasana (Lord Indra’s throne). But, instead of ‘Indraasana’, he asked for ‘Nindraasana’ (a bed for sleeping). Also, he intended to ask for ‘Nirdevatvam'(annihilation of the Devas) and instead asked for ‘Nidravatvam'(sleep). The boons were granted. However, his brother Ravana asked Brahma to undo this boon as it was in reality, a curse. 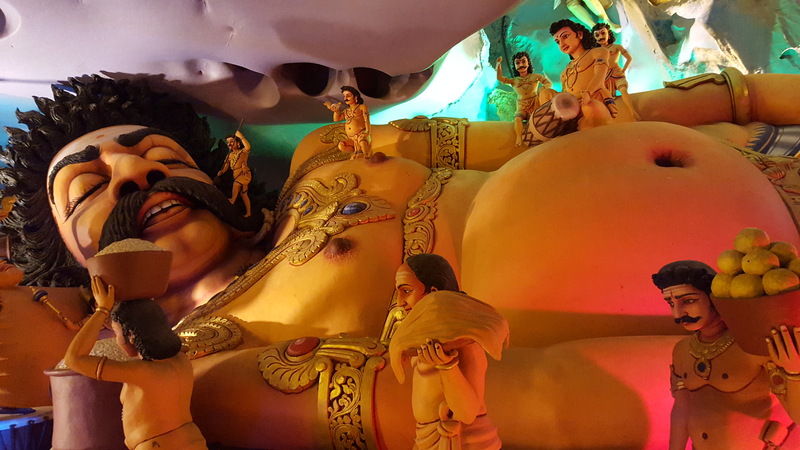 Due to this boon, Kumbhakarna slept for six months and when he awoke, he ate everything in the vicinity including humans. 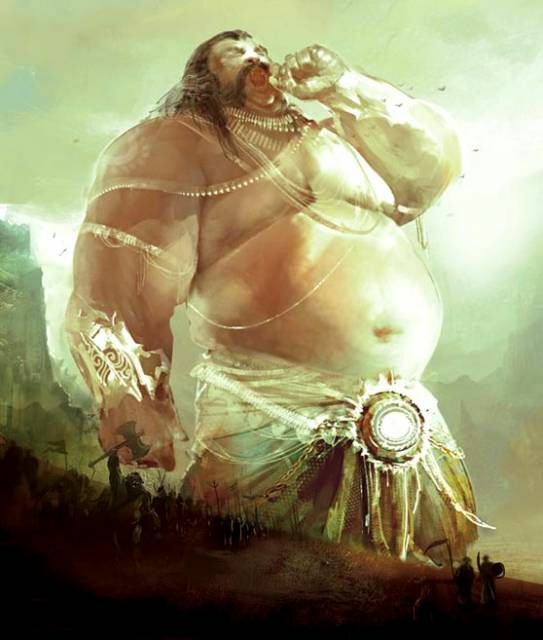 Although Kumbhakarna was an asura, it issaid that he was very fair, loyal and righteous. He was intellectual and very powerful. Kumbhakarna hated war and violence. He was inclined towards philosophy. Observing his genuine character and addressing his interest, it is said that Narad Muni had taught him philosophy. Kumbhakarna had no interest in wars, harming others or committing any sin. His ethics and character can also be seen during the circumstances of war in the famous epic Ramayana. Kumbhakarna hated war. So, when he woke up and came to know that his brother had kidnapped Lord Rama’s wife, Sita, and the war had prevailed, he went to his brother, Ravana and tried to convince him to go to Lord Rama and ask for forgiveness. Kumbhakarna tried his best to make Ravana understand that what he was doing was actually wrong. Meaning, “After kidnapping the ‘jagat janani'(Lord Rama’s wife, Sita), if you expect happiness for yourself, you are a fool. During the war, Ravana went into battle and was humiliated by Rama and his army. He decided he needed the help of his brother Kumbhakarna, who was awakened with great difficulty. He woke up only after one thousand elephants walked over him. Kumbhakarna was a noble soul. So he told Ravana that he had ignored the principles of statecraft and had not consulted the council before committing the sin. But when Ravana refused to cancel the war, Kumbhakarna had to agree to be a part of the war to maintain his brother’s pride. More precisely, Kumbhakarna’s loyalty and love to his brother outweighed his sense of dharma. Kumbhakarna knew that Lord Rama was the avatar of Lord Vishnu and it was impossible to defeat him in war. Despite all this, he went into the battlefield. 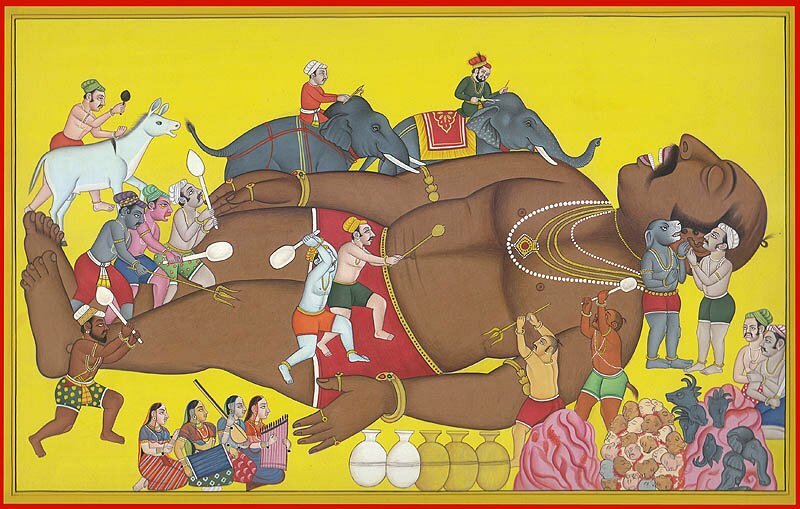 However, Kumbhakarna was so powerful that he devastated Rama’s army and injured Hanuman but was killed by Lord Rama. When Ravana heard of his brother’s death, he fainted and proclaimed that he was truly doomed. It is said that there’s a reason behind Kumbhakarna’s acceptance to be a part of the war. It is said that he sought Moksha. According to Shri Ramcharitramanas, Kumbhakarna went to fight Lord Rama with an intention of availing Moksha. He was a huge devotee of Lord Vishnu, hence a devotee of Lord Rama too. When Lord Rama’s arrow shot him dead, he achieved Moksha.